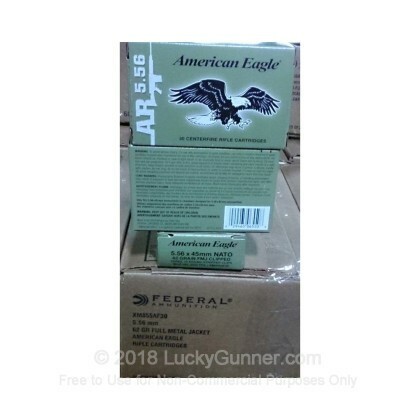 If you are looking for a great range training ammunition for an affordable price, look no further than 5.56x45mm Federal American Eagle centerfire rifle cartridges. These 62 grain full metal jacket projectiles will hit your target with the accuracy and precision we all expect from Federal. Loaded to the same specifications as Federal's more expensive Premium line, these rounds give you the function you need, but for a fraction of the cost. This 600 round box will allow you to shoot all day, gaining as much practice as you'd like, without being out much money. The brass cases are loaded with reliable Boxer primers and clean burning powder that will go easy on the barrel of your rifle. We've all heard the saying "practice makes perfect". That's why Federal developed this line of ammunition: for the high volume shooter. For many years, Federal has been making customized ammunition for all types of shooters. Whether it's recreational, hunting or professional, Federal has something for everyone. Order your 600 rounds and get to practicing!